Listen up, parents (or aunts, uncles, grandparents, babysitters): resist the temptation to buy the kid in your life a book just because it is authored by a celebrity. Your five-year-old doesn�t know who Madonna is, or that Henry Winkler is best known for playing �The Fonz.� Elmo is a big star to a kid. Bill Cosby, Jamie Lee Curtis, and John Lithgow are not. Yet all these celebrities (and they aren�t the only ones) have written children�s books. Some are good, some... aren�t so much. Which is why, as with any books, parents should choose their children�s reading material based on quality, not the prestigious name above the title. Jamie Lee Curtis is one celebrity who has been successful -- and prolific -- as a children�s author. She has written five books, Tell Me Again About the Night I Was Born being one of them. I really want to like this book, and for the most part I do. But the refrain that begins every sentence, �Tell me again...� is just so very annoying. I realize it�s written in a child�s voice, but it�s kind of like hearing �Are we there yet?� over and over again on a long car trip. That aside, it really is a sweet story about the beginning of a new family as a child is adopted. Another prolific celebrity author is none other than Bill Cosby. His �Little Bill� series is geared toward beginning readers, and each contains a lesson. I read The Meanest Thing to Say, in which Little Bill learns the best way to deal with a bully�s taunts is to simply ignore them rather than retaliate. Cosby holds a doctoral degree in education, so in addition to being just a celebrity he must know (one would hope) a little something about his intended audience. These books both entertain and teach, although not in a preachy way, and they portray a diverse cast of characters having fun and interacting with their families. 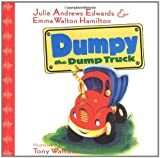 Julie (�The hills are alive...�) Andrews Edwards and her daughter Emma Walton Hamilton write a series of books about a dump truck named Dumpy. In Dumpy the Dumptruck, we get a standard issue children�s story complete with problem (Dumpy is literally being dumped, as there is no longer a use for him) and happy ending (Dumpy, having been rehabilitated, proves his worth after helping raise the new barn). Julie Andrews has also written children�s novels, which I remember reading in elementary school. Not to be outdone, male celebrities have also realized their literary ambitions. Henry Winkler co-authored (with Lin Oliver) Niagara Falls or Does It? This is the first in a series about a learning challenged boy named Hank Zipzer. These books are geared toward a slightly older audience, the 9-12 year old range, according to Amazon. Told in a conversational style, they make reading approachable to those who might normally shy away from books. I like that the protagonist is a boy, because outside of Harry Potter, there don�t seem to be as many children�s novels written for a male audience as there are for their female counterparts. Or maybe I�m just remembering all those unfortunate �I love horses� books and cheesy teenage romances that were in print when I was a kid. Anyway, Henry Winkler himself apparently has a learning disability, which gives him more credibility as an author. John Lithgow writes rhyming stories that would normally grate on my nerves, but his rhymes in The Remarkable Farkle Mcbride and I'm a Manatee are so clever and well-thought out that I can�t help but like them. It also helps that the illustrations are great. Which brings me, of course, to the celebrity children�s author du jour: Madonna. Madonna apparently wants to make sure those who don�t know her for her music or lamentable movies know her for her literary endeavors. She�s had two books published this season, and we have been threatened with three more. The English Roses was released to great fanfare around the world. In this morality tale, a clique of popular girls learn to look beyond the surface and accept a prettier girl into their circle of friends. Excuse me, Madonna, but what planet are you living on where the pretty girls are the social rejects? It�s been my experience that it is the shy, bookish, glasses-wearing nerds who are rejected by the pretty girls. Nice try at writing a story with a message, but maybe the message would be better received if the shunned character were a paraplegic or an ethnic minority. Or a shy, bookish, glasses-wearing nerd. It�s a universal motif, but the story is not told in a way that most readers will be able to relate to. Hopefully Madonna�s writing will improve with time. Regardless of their quality, or what I personally think of them, I do find it admirable that these celebs are using their free time to write books for children, because I�m all about contributing to the literacy of our youth. That said, not all celebrities should take a stab at writing children�s books. Christina Aguilera, George Bush, Michael Jackson -- I�m talking to you.